Yesterday’s judgement and award in Ohio with respect to the Chemours “C8” litigation risk, only helps to confirm the cautionary stance that we took once the first case was heard in 2015. This could become a major liability for both companies, and without some sort of broad indemnification from DuPont could be far more serious for CC than is currently implied in the stock. While Chemours and DuPont will likely continue to contest the awards, a $10.5 million punitive award on top of a $2m compensatory award for one plaintiff sets a very worrying precedent. Around 15-20% of the 3500 plaintiff group are alleged to have or have had cancer or pre-cancerous conditions, but this still results in a very large number if you do the simple math. It is not an unreasonable assumption that this could turn into a $2-4bn settlement if things do not start moving in the direction of the defendants. We note that in 2001 Dow Chemical in its 10K discussed a potential liability from asbestos post the Union Carbide acquisition of $233 million, all of which was to be covered by insurance. By the same time the following year this estimate of liability had increased to $2.2 billion – see chart! At this point as much as $1.0 billion was not covered by an expected insurance receivable and Dow took an $800 million plus charge in that year. In this case Dow/Union Carbide was only looking at the tip of the iceberg in 2001. We believe that this issue is dragging on valuations for both DuPont and Dow today and that some sort of settlement might actually be positive for the stocks. The lack of reaction to the award in Chemours stock suggests that investors expect DuPont to bail out Chemours – certainly Chemours does not have the cash flows to set aside as much money as might be needed. We would not own CC here – we think that the company will have to share some of the costs and that the risks of this as well as other possible litigation are not priced into the stock. 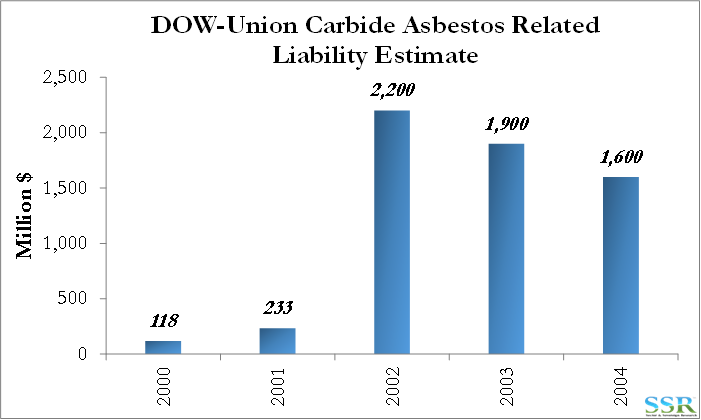 In addition to the chart of Dow’s asbestos liability we also include a couple of excerpts from Dow 10K’s during that period – appropriate actuarial estimates of liability in 2001 turned out to be off by a factor of 10 within 12 months.